Do you have a craft cupboard? In our house we have a nice old cupboard in which we store all our craft supplies. All the bits of fabric that I have (which, surprisingly, is not that much), sewing supplies, paint, glue, and the odds and ends left over from the various crafts I have dabbled in over the years, are stored in there. A few weeks ago I was rummaging around in there, and I couldn’t believe how much junk had miraculously appeared in there. Obviously I needed to get in a sort that bad boy out. It’s amazing how much stuff accumulates, especially when you remember I’m a natural chucker of useless stuff. There were the remnants of kids craft kits – you know the bits that are left over after the craft has actually been done, folk art paints (remember when folk art was a thing??) that were dry and crusty, and a few things that I didn’t even recognise. With my mum’s help I pulled out all the drawers and started sorting. I sat and checked every bottle of paint and chucked all the dried and separated ones. All the gunked up paintbrushes (kids never wash those out properly before putting them away) were tossed out too. While I did that, my mum went through my sewing box and put all the bobbins into a case and separated the various bits and pieces into a more organised fashion. I threw a big bag of stuff into the garbage, and my mother took a small bag of fabric and other supplies that I no longer need as well. Some will be donated, while she plans to use some herself. I’m always glad when someone is happy to use my unwanted things. After everything had been sorted, we vacuumed out the drawers before putting the craft supplies back into them. 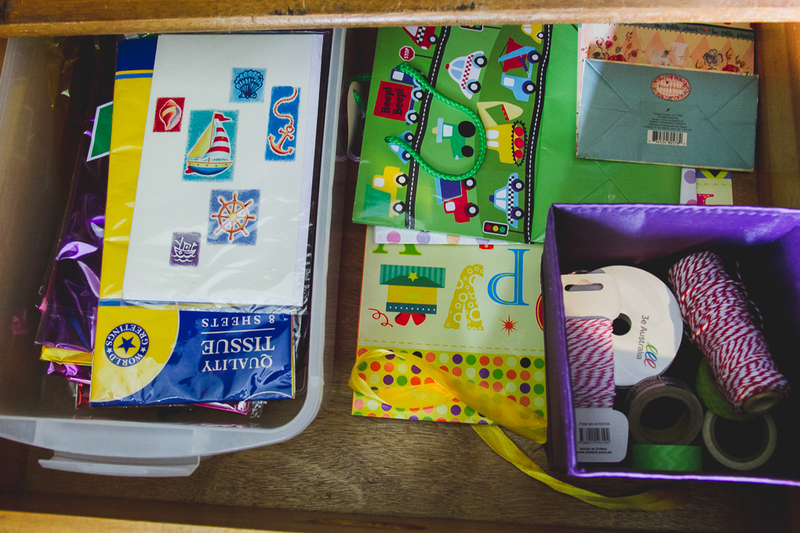 Gift wrapping supplies in the top drawer (I always keep a few cards and some wrap on hand), fabric in the next, my craft supplies in the third drawer, and kids craft supplies down the bottom. All the paints went into a container on the shelf, as did the glue gun, and my sewing box. Best of all the cupboard still had space left in it. Clearly I had been storing too much junk! My goodness, it felt great to have that cupboard cleaned and organised. No more dreading having to scrabble around in there whenever I need a button, or a bit of ribbon. We have to move out of our house in October while our house extension and renovation happens, so I’m on a bit of a purging spree. I do not want to pack and move anything I don’t have to. Tick that cupboard off the list. 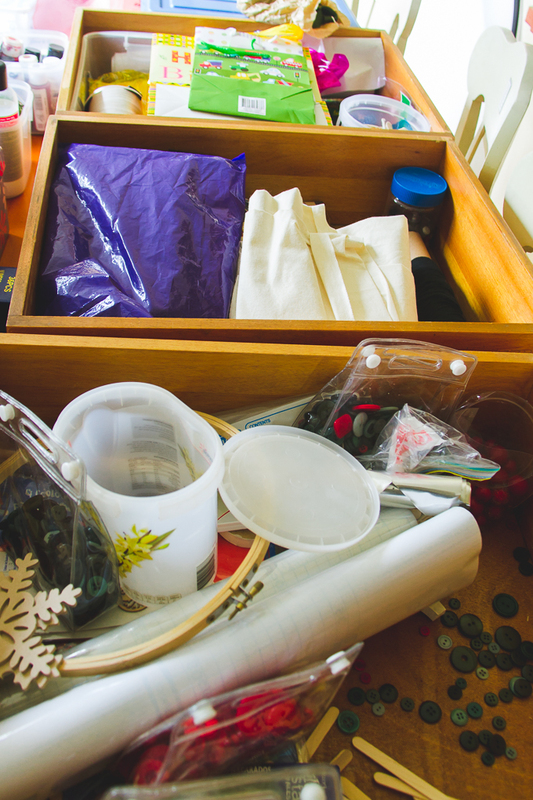 Do you have a craft cupboard in need of sorting? 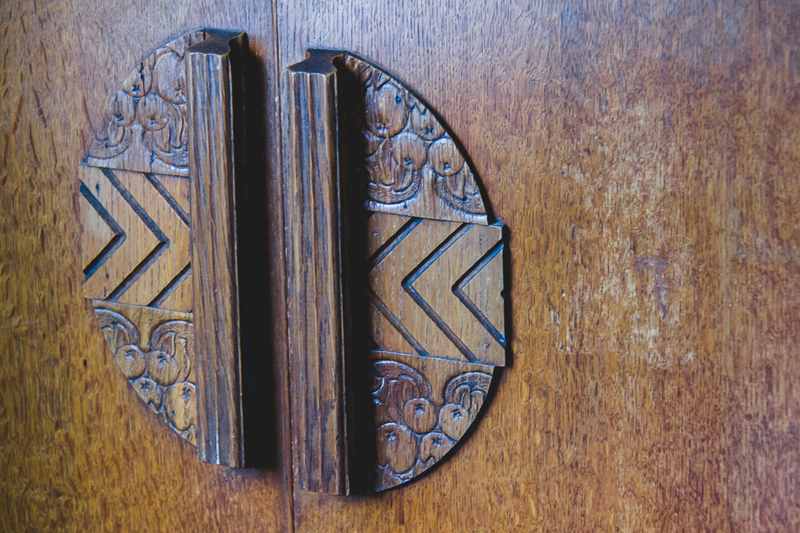 What’s your one thing to do this week? 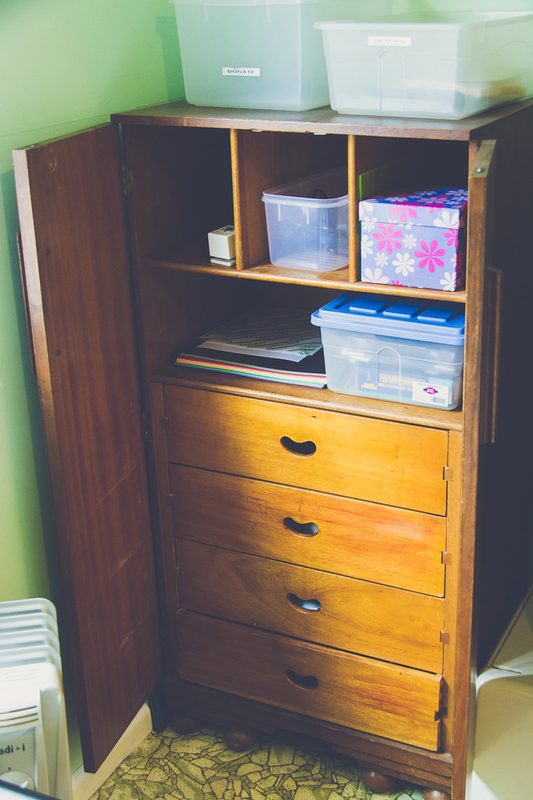 My cupboard isn’t quite as nice – it was actually free, and all my pencils are kept in lindt hot chocolate flakes tins – but its nice to have somewhere to put all the art and craft stuff and be able to shut the door on it all. I love the drawers in your cupboard, it looks like a very unique piece. Now I want a cupboard with drawers in it, too! I recently went through the fabric stash that somehow accumulated itself when I wasn’t looking and sent a whole lot off to the op shops. It was a great feeling. Now my fabric stores are full of fabrics I like and can envisage using. Good luck with the rest of your pre-October clean-up.